Normally I don't attend men fashion shows, but for a show that is known for using beautiful models (from the street) I couldn't resist. Also, my teen-dream-idol Jim Bakkum joined the catwalk forces. Knowing that it is extremely not cool to still have a weak knees for the guy that used to be on my posters, I can't get around the fact that he again looked mighty-fine. 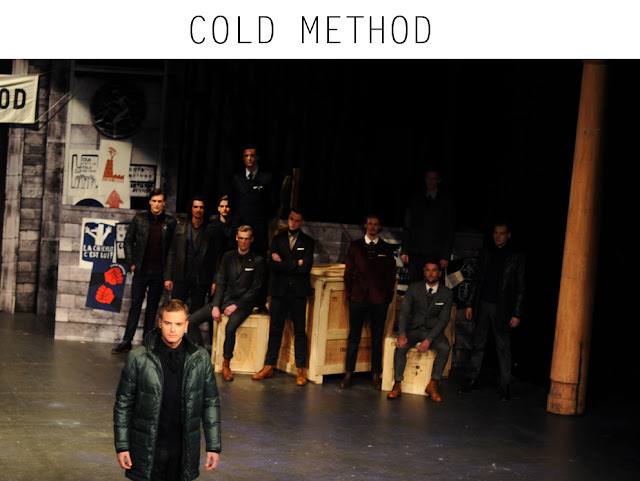 All jokes aside, Cold Method's show was a great reflection of what I would like my man to be wearing. A layered, subtle colored and varied show, rich of class. Bravo, Dieter! Hele mooi kleding en wat een fijn aangekleed decor..
Toch maar eens mijn vriend overhalen meer Cold Method te kopen!